Virgin Orbit formally signed an agreement with officials from Cornwall July 16 that would lead to missions of the company’s LauncherOne air-launch system flown out of Cornwall Airport Newquay, also known as Spaceport Cornwall. 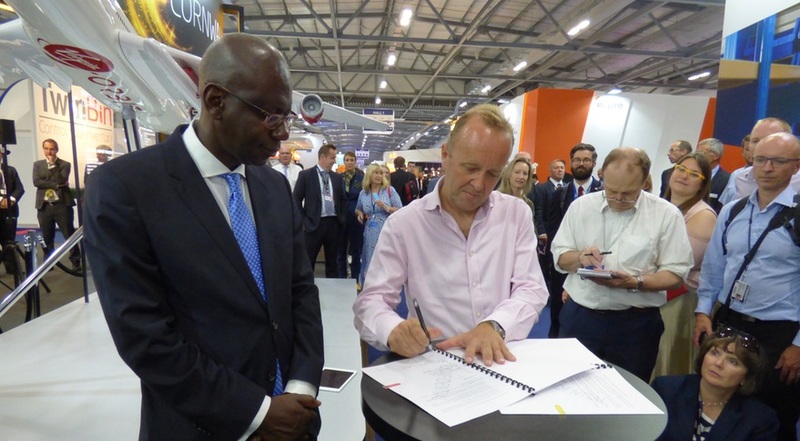 The signing ceremony took place during the Farnborough International Airshow, a day after the agreement was announced. In an interview after the signing ceremony, Patrick McCall, managing director of Virgin Group and chairman of the board of Virgin Orbit, said that one reason the company decided to seek a British launch site was to support development of the country’s industry by providing a means to launch satellites built in the U.K.
British officials have emphasized the desire to establish a launch capability to address a gap in the country’s space capabilities. That has driven work to support both the development of launch vehicles as well as spaceports that can host those launches. That effort achieved its latest milestones at Farnborough, with the announcement of a spaceport in northern Scotland to be used by Lockheed Martin and Orbex, and the separate agreement between Cornwall and Virgin Orbit. The same arguments have been made at the local level as well. “This partnership with Virgin Orbit today will make a major contribution to Cornwall’s ambition to create a one-billion-pound space economy as part of its response to the U.K. Industrial Strategy,” said Adam Paynter, leader of the Cornwall Council, at the signing ceremony. Virgin Orbit plans to begin launches later this year on flights out of the Mojave Air and Space Port in California. However, it is looking into several other launch sites, both in the United States and other countries, for LauncherOne missions. Prior to the Cornwall announcement, the company announced an agreement with Italian company Sitael earlier this month to study missions flying out of an airport in southern Italy. That diversity of launch sites is driven by customer interest, said Will Pomerantz, Virgin Orbit vice president. “We’re impressed by how many people are interested in becoming a launch site,” he said after the signing ceremony. A bigger challenge, though, may be regulatory issues. As Cornwall officials work to be licensed as a spaceport by the British government, Virgin Orbit will also need to be licensed, but only after securing export control agreements with the U.S. government that will allow the company to share detailed technical information with British regulators.